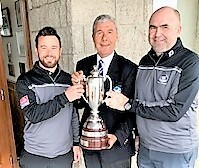 Newmachar 2 (Mark Rae and Steve Gauld) won the Simmers Trophy club team foursomes tournament at Cruden Bay today with a two-over-par round of 72. Peterhead (Scott Anderson and Drew Buchan) were runners-up with 75 and Duff House Royal 1 (Lewis West and Ellis Gray) pipped Cruden Bay 2 (Scott Robertson and Stewart McCulloch) for third place with a better inward half. Both teams finished on 76. +Newmachar's last win in the Simmers Trophy was in 1994 when they were represented by John Crammond and Alistair Crombie. 72 Newmachar 2 (Mark Rae, Steve Gauld). 75 Peterhead (Scott Anderson, Drew Buchan). 76 Duff House Royal 1 (Lewis West, Ellis Gray) bih, Cruden Bay 2 (Scott Robertson, Stewart McCulloch). 78 Newmachar 1 (James Wilson, Chris Simpson), Northrn 2 (Neil Walker, Cameron Johnstone). 79 Bon Accord (Matthew Dunn, Ross Allerton), Inverallochy 2 (Marc Palmer, Ross Strachan). 80 Royal Aberdeen 1 (Grant Joss, Daniel Sim), Cruden Bay 1 (John Godward, James Booth), Murcar Links (Anthony Bews, Corin Stewart), Inverallochy 1 (Zander Stephen, Wilson Stephen). 81 Caledonian 2 (Walter Ross, Levi Ross). 82 Turriff (Andrew Purdie, John Dalgarno), Nigg Bay 1 (Gary Stewart, Lee O'Connor). 83 Banchory 1 (Adam Lindsay, Mark Lawrence), Northern 1 (George Paterson, Stuart Slessor). 84 Caledonian 1 (Stuart Whyte, Matty Beattie), Banchory 2 (Craig Lindsay, David Brand). 85 Duff House Royal 2 (Jordan Sleigh, Phil Gordon). 86 Nigg Bay 2 (Kevin Dalglish, Steven Bennett). DQ Deeside (Philip Adam, Tom Rennie).